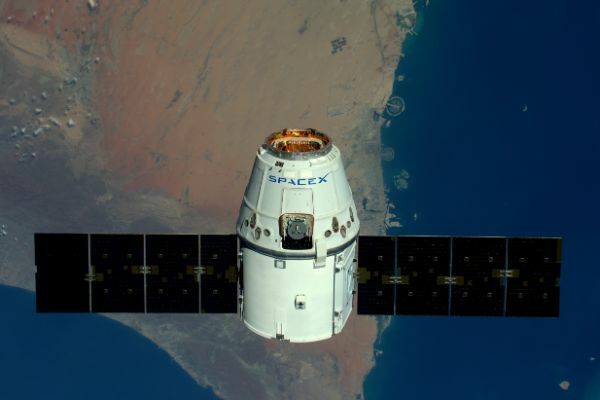 Dragon SpX-14 is the fourteenth operational mission of SpaceX’s Dragon spacecraft to the International Space Station under NASA’s Commercial Resupply Services contract. 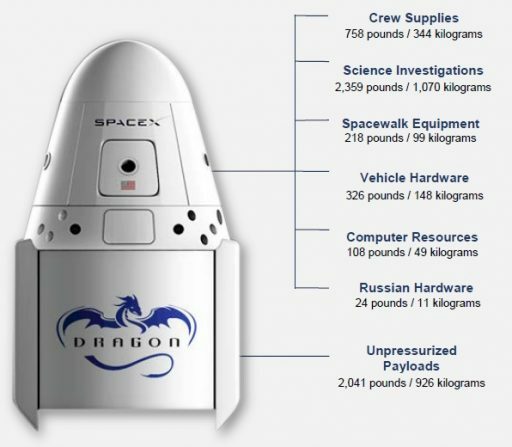 It is the first of at least three Dragon cargo missions planned in 2018. 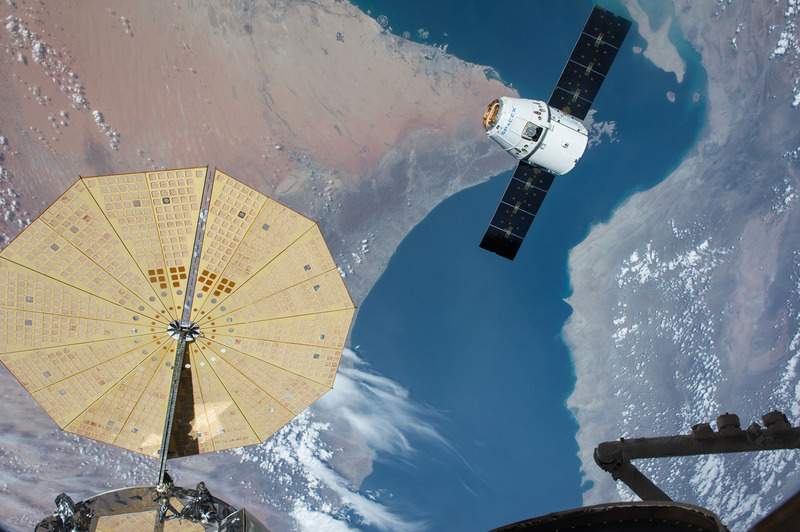 Loaded with more than two and a half metric tons of cargo, Dragon will be delivering the typical mix of utilization hardware, maintenance gear and crew supplies to the Space Station to keep up its capability of serving as a world-class laboratory in Low Earth Orbit. The 14th regular Dragon flight will carry three external payloads to the Space Station: the MISSE Flight Facility as a new state-of-the-art exposure facility for materials science outside the Space Station, the ASIM instrument to study interactions where Earth’s atmosphere meets space, and a spare pump assembly for the Station’s photovoltaic power-generation system. The Dragon SpX-14 mission is part of the CRS-1 contact extension awarded by NASA to bridge a gap to the second round of Commercial Resupply Services contracts that cover the Space Station’s cargo requirements for the first half of the 2020s. Under the CRS-1 extension, SpaceX will keep flying Dragon 1 spacecraft through CRS-20 while Orbital ATK received an order of three additional missions. 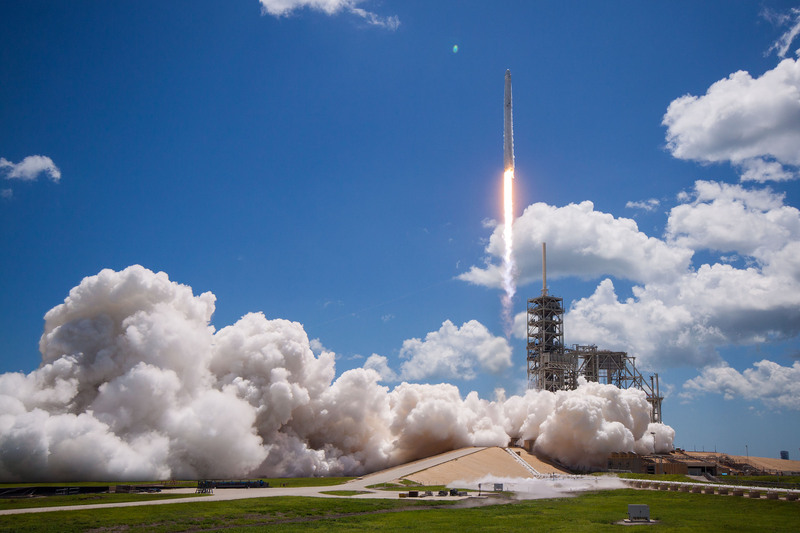 Dragon SpX-14 is the third SpaceX cargo mission to fly a re-used spacecraft and the second to employ a “flight-proven” Falcon 9 first stage as part of the company’s re-use business model that has taken major steps toward becoming routine over the past year. 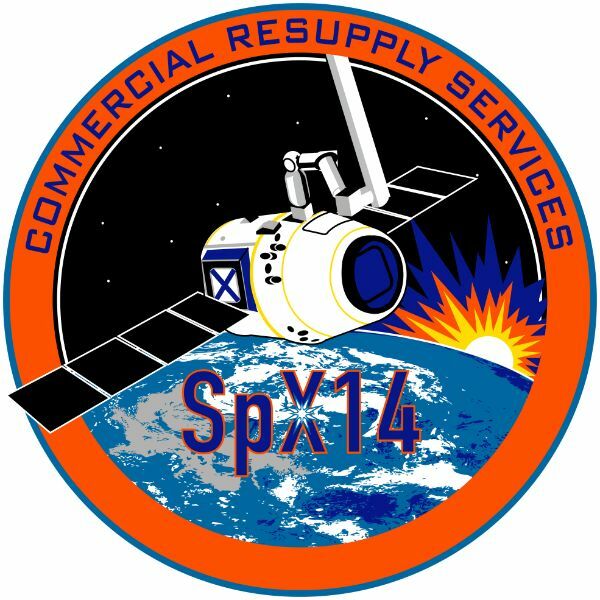 The SpX-14 mission is re-using the Dragon C110 spacecraft that spent 33 days in orbit in April/May 2016 supporting the Dragon SpX-8 mission, delivering 3,136 Kilograms of cargo to the Space Station including the Bigelow Expandable Activity Module. The Falcon 9 launching this mission will employ Booster #1039 from the SpX-12 mission of August 2017. NASA completed extensive reviews of data on the condition of previously flown Falcon 9 first stages and life-leader experimentation as well as SpaceX’s successful re-use missions in 2017 to conclude that the use of flight-proven first stages comes with no to minimal additional risk to the success of the overall CRS mission. Engineering reviews cleared Dragon missions to fly on first stages with no more than one prior Low Earth Orbit mission, excluding first stages that have gone through more rigorous re-entry environments when flying higher energy missions like GTO deliveries. Dragon SpX-13 in late 2017 was the first NASA CRS mission to fly on a previously used Falcon 9. All in all, Dragon SpX-14 is delivering 2,647 Kilograms of cargo to the International Space Station, primarily focused on utilization hardware and dozens of science experiments – some of which are to be completed while Dragon is attached to ISS in order to ride back to Earth on the spacecraft. Also aboard the Dragon is the largest satellite to be deployed from the Space Station to date. Dragon takes a unique spot on the Space Station’s cargo vehicle roster, given its ability of returning meaningful quantities of cargo to the ground – allowing for the return to performed experiments for laboratory analysis and the return of failed hardware for inspections and/or refurbishment. To that end, Dragon SpX-14 will be tasked with ferrying nearly two metric tons of cargo back to Earth, primarily consisting of science hardware and experiment samples riding back to the ground in laboratory freezers and double cold bags. RemoveDebris is a small satellite mission by Surrey NanoSatellite Technology Ltd. under a European Union Framework 7 research project to develop and fly a low-cost demonstrator for the key aspects of Active Debris Removal missions on a quest to address the growing space debris problem. 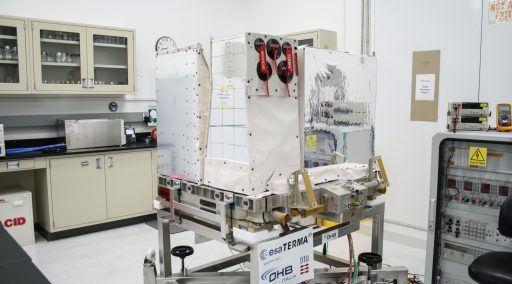 The 100-Kilogram, cube-shaped satellite – the largest deployed from the International Space Station to date (2018) – will demonstrate active debris removal techniques by releasing, tracking and capturing two small CubeSats called DebrisSATs, in the process demonstrating different rendezvous, capture and deorbiting techniques to evaluate their feasibility for operational debris removal missions of the future. 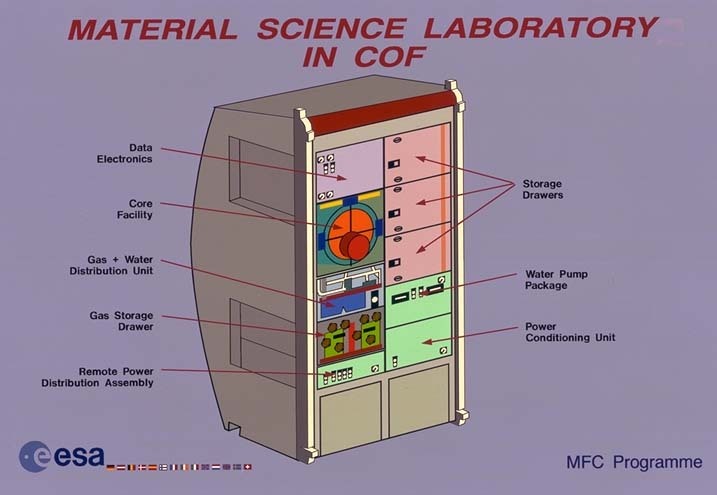 The Materials on ISS Experiment – Flight Facility (MISSE-FF) builds on the success of the original MISSE Passive Experiment Container concept which consisted of smaller and larger sample plates containing a variety of surface materials for exposure to the space environment outside the International Space Station for varying durations to inform satellite designers on how different materials degrade over time. The MISSE-FF project created a platform capable of holding 14 exchangeable sample modules for powered & heated payloads as well as passive experiments. ASIM, the Atmosphere-Space Interactions Monitor, is an ESA science instrument taking up residence outside the Columbus Module of the International Space Station to study Transient Luminous Events (TLEs) in Earth’s upper atmosphere like Blue Jets, Red Sprites and Elves via a suite of cameras and photometers sensitive in a broad wavelength range to reveal previously unknown details of the electrical and chemical processes ongoing where the atmosphere and space interact. The third Trunk Payload riding on the Dragon SpX-14 mission is not a science/utilization instrument like its two companions but a potentially critical spare part for the Space Station’s Thermal Control System. 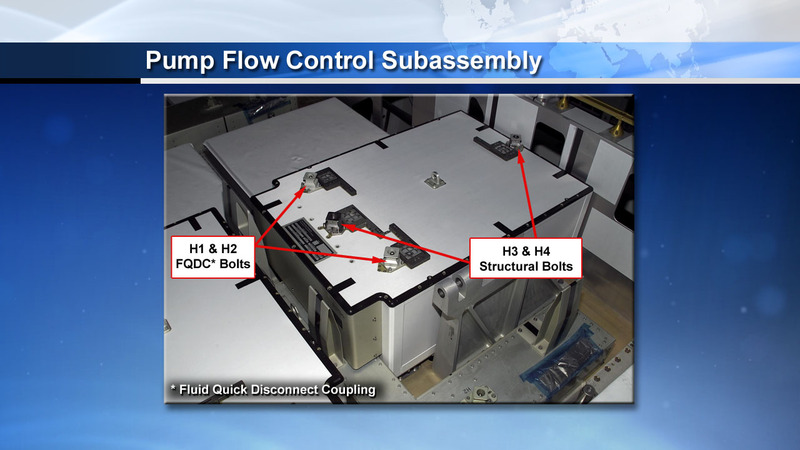 The Pump Flow Control Subassembly, PFCS for short, is a critical component of the ISS Photovoltaic Thermal Control System (PVTCS) in that it routes ammonia coolant to transport heat from the various electrical assemblies located within the Integrated Equipment Assembly to a Photovoltaic Radiator where it is dissipated into space. The MSL SCA-GEDS-German experiment will be run in the Materials Science Laboratory aboard ESA’s Columbus module to look into the underlying mechanisms of sintering processes and their ability of creating hardened materials. The Physical Sciences experiment was developed at San Diego State University under Principal Investigator Randall German. Sintering is the process of compacting and forming a solid mass of material by heat or pressure, typically with the goal of creating a hardened piece of material. Typically, sintering occurs without melting the material to the point of liquefecation, though liquid-phase sintering has been a method used for the fabrication of net-shaped composite materials. Although sintering has been used for centuries and is a critical element in a large number of industrial branches today, the underlying scientific principles are only poorly understood. The goal of this experiment is to determine the mechanisms driving the density, size, shape, and properties for liquid phase sintered bodies in Earth-gravity and microgravity conditions with special focus on the causes of distortion in the material that appears to be alleviated by the presence of a gravitational force. During low-temperature sintering, powders can gain strength through interparticle bonding – typically through solid-state surface diffusion, followed by further strengthening at high temperatures driven by densification of the powder material. However, a secondary process occurring at high temperatures causes a softening of the material due to a distortion phenomenon. While conducive for the formation of net-shaped composites it is counterproductive if only densification is desired. Working out the interplay between the various processes may allow for a sintering method to be developed that can accomplish densification without distortion. Previous studies have shown surprising results as gravity may be playing a beneficial role in reducing distortion – in contrast to a very large number of physical processes where gravity has been identified as a disturbing force. Microgravity liquid-phase sintering experiments performed to date have shown a lesser degree of densification and higher distortion, raising questions on the underlying mechanisms to fully understand the role of gravity to work out routes for minimized distortion. It has been found that when a liquid phase forms, densification can be accelerated via solid transport within the liquid, capillary forces and liquid lubrication. This, however, only works to a certain degree as long as there are solid bonds or open pores in the sintering body. If the degree of liquefecation outweighs the solid material, substantial weakness is introduced. Scientists have likened this process to building a sand castle which works poorly when one only has dry sand with no strength and no ability to hold shape or when sand is saturated with water. It works best with an intermediate mix where the liquid pulls the sand grains into contact and gives the greatest strength. The MSL SCA-GEDS-German experiment observes phase changes and product formation within solid mixtures undergoing spontaneous reaction in the absence of gravity to find out what causes lower performance, an inability to eliminate pores, and higher distortion. Cartridges with different sample materials will be delivered to ISS by Dragon SpX-14 and fully processed within the Materials Science Laboratory (MSL) Low Gradient Furnace (LGF) followed by return to Earth for sample analysis with the added context of temperature profiles and other sensor data from the furnace. 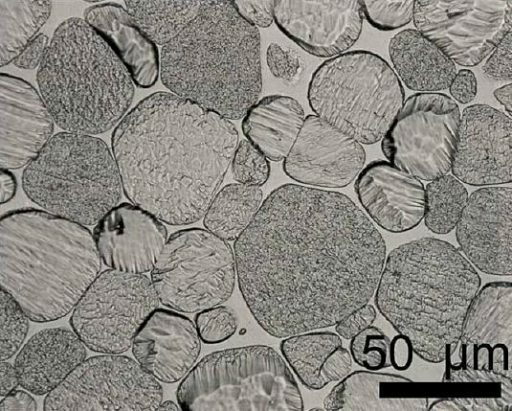 Knowledge gained by this experiment will be beneficial for sintering processes on Earth as information on the underlying mechanisms of distortion will lead to better protocols to increase densification. For the spacefarers of the future, knowledge on sintering in zero- or reduced gravity environments is of importance as extraterrestrial repair and construction based on freeform fabrication from powders will be a key element of settlements on the Moon, Mars and beyond. 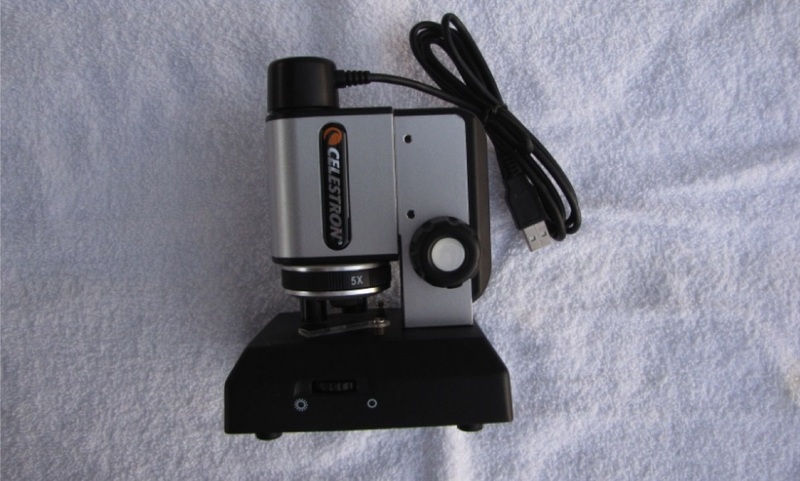 The first of the three Microscopes offers objectives for 5x, 10x and 20x magnification, Microscope-2 has the same video head but adds a lighting system and offers 20x to 40x, and 200x digital power magnification as well as a 20x eyepiece for viewing with 4x to 8x, and 50x power. Microscope-3 is a handheld microscope with a 5-megapixel imager, adjustable polarization to set the proper light level and reduce glare, eight LEDs for sample illumination, and 10x to 240x zoom magnification. The Multi-Use Variable-G Platform, MVG, is a product of Techshot to expand the Space Station’s scientific repertoire by adding a new centrifuge facility capable of producing anything between microgravity and 2 G of artificial gravity. 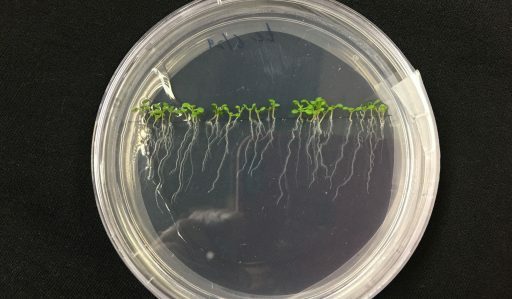 This will open up possibilities for a large number of studies, including commercial exploitation of the novel environment found on the International Space Station. MVG is suitable for a number of sample types, including fruit flies, flatworms, plants, fish, cells, protein crystals and many others. MVP is a commercially developed, manufactured, owned and operated platform, offering a pair of 39-centimeter carousels that can produce up to 2G of artificial gravity with six experiment modules on each carousel. The facility is designed to allow for easy exchange of sample modules, permitting a large number of experiments to be completed with little crew time requirements. 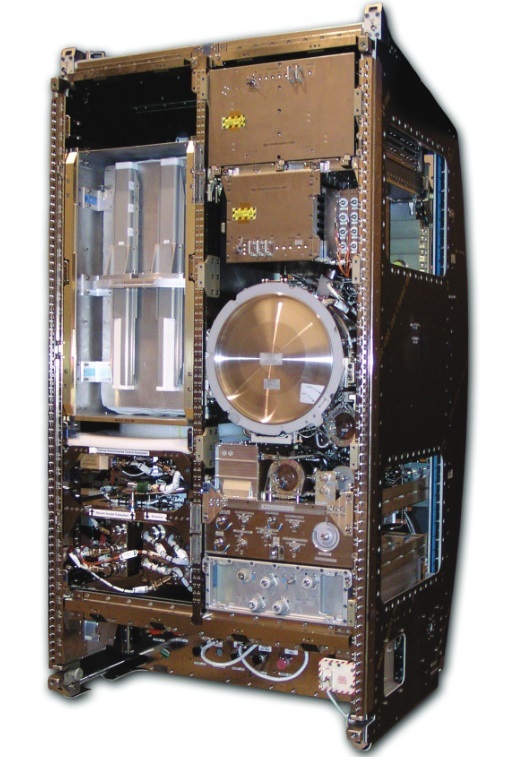 Real-time video and still imagery, including microscopy, can be provided for each sample module per the specific needs of every experiment and the facility provides additional environmental control with a temperature range of 14 to 40 °C and a humidity between 50 ad 80% while data logging is provided for Oxygen and Carbon Dioxide. 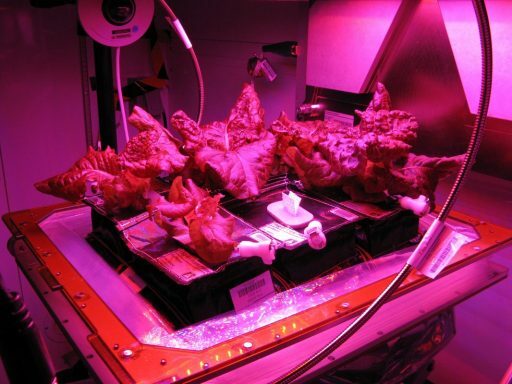 Veggie PONDS uses the existing Veggie plant-growth hardware present on the International Space Station as well as knowledge gained through the initial experiment runs to develop a passive nutrient delivery system that could build the basis for the reliable plant production facilities on future long-duration space missions. PONDS, the Passive Orbital Nutrient Delivery System, addresses some of the deficiencies found with the standard plant pillow system employed by the initial Veggie runs and will also expand the facility’s envelope by supporting larger leafy vegetables and fruit crops like tomatoes which will be grown as part of the Veg-05 experiment. The PONDS system is designed to mitigate microgravity effects on water distribution, increase oxygen exchange and provide sufficient room for root zone growth. The initial PONDS experiment has the goal of validating whether improved water and nutrient delivery can produce a more uniform plant growth and increase crop yields. The experiment will use ‘Outredgeous’ red romaine lettuce and mizuna mustard plants, the former has been used for studies Veg-01 through Veg-03 and will allow for comparisons between plant pillows and PONDS. Another aspect will be studying the microbial load of plants grown during the initial Veggie runs and those provided with PONDS technology. The PONDS architecture was designed at the Kennedy Space Center and involves contributions by TechShot, and commercial partner Tupperware. PONDS retains the arcillite, a calcined clay type, as growth medium which has been selected through comparative studies in the earlier Veggie runs and PONDS continues as single-use hardware, only employed for one growth run to manage microbial contamination. Like previous runs, PONDS will use the cut-and-come again harvest technique with four planned harvests or more if plant growth allows. The crew will be cleared to consume any lettuce that is not needed for analysis on the ground. Veg-01 ran in 2014 and provided valuable data in the form of returned water samples and root pads, imagery acquired in orbit of the growth process, and plant samples that were brought back to Earth. This data helped investigators assess the two different growth media with respect to water and root distribution within the different sized particles to chose media for future Veggie missions. Although the overall Veg-01 experiment was a success, a number of deficiencies with regard to the plant pillows and the water delivery systems were identified leading to modifications made to the pillows and watering procedures that will be tested by Veg-03, also introducing a different crop with different water requirements. In 2015, the Space Station crew got their first taste of home-grown lettuce harvested from the Veggie Plant Growth Unit. Another 2015 study provided the crew with a touch of color when the first flowers grown on ISS were harvested by Astronaut Scott Kelly. Veg-03 A-C tested different crop harvest techniques, showing that cut-and-come again repetitive harvest could be used to double the amount harvested with the same set of starting materials; Veg-03 B and C tested a new crop, Tokyo bekana. The Veg-03 D-F experiments looked into mixed growth of different leafy greens and different harvest schedules. The Veggie experiment facility provides lighting and nutrient supply and is capable of supporting a variety of plant species that can be cultivated for educational outreach, fresh food and even recreation for crewmembers on long-duration missions. 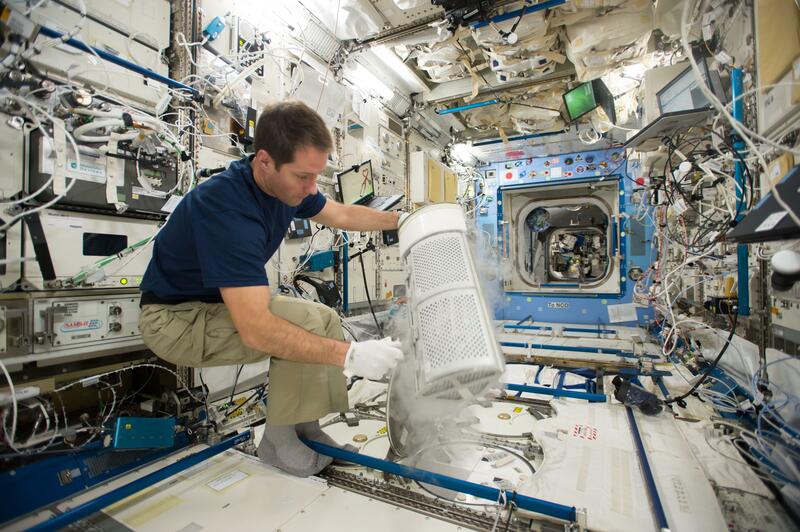 Thermal control is provided from ISS in-cabin systems and the carbon dioxide source is the ambient air aboard ISS. 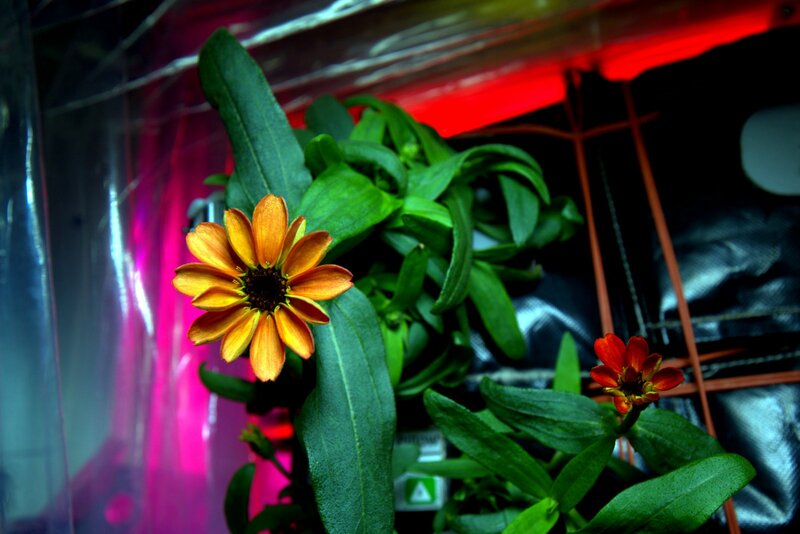 Plants grown in the Veg-03 facility will be observed to determine how plants sense gravity and how they respond to microgravity. Serving as a pathfinder, the plants grown as part of VEGGIE will be harvested and studied before being cleared for consumption by crew members in orbit. 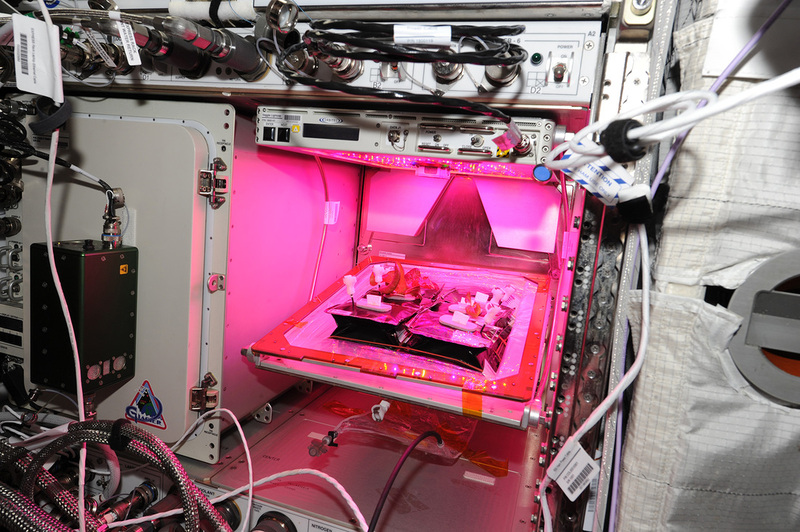 The VEGGIE facility is the largest volume available aboard ISS for plant growth, which will allow the study of larger plants that could not be grown in previous experiments. Veggie uses a plant growth chamber using planting pillows and an LED bank to provide lighting. Ground testing of the pillow planting concept led to the selection of growth media and fertilizers, plant species, materials, and protocols. The facility weighs 7.2 Kilograms and measures 53 by 40 centimeters and permits a maximum growth height of 45 centimeters. The root mat has a growing area of 0.16m² with a 2-liter fluid reservoir. The system draws 115W of peak power and its LED banks can support adjustable wavelengths, light levels and day and night cycles to match the biological needs of the plants. A transparent teflon cover allows viewing of the plants. The plants will be photographed regularly to assess plant growth rates and health. Tissue samples will provide information on possible growth anomalies when being compared to ground controls. Environmental data will be provided by a data logger that measures temperature, humidity and pCO2. The first studies performed with VEGGIE will also provide microbial samples of the plants and pillows to assess the level of microbial contamination and implement corrective measures if needed. For most species, microbial contamination levels will be well within limits and pose no threat to the crew. Other species that naturally have higher levels of microorganisms may need a sanitation method which must be developed and tested as part of the experiment. 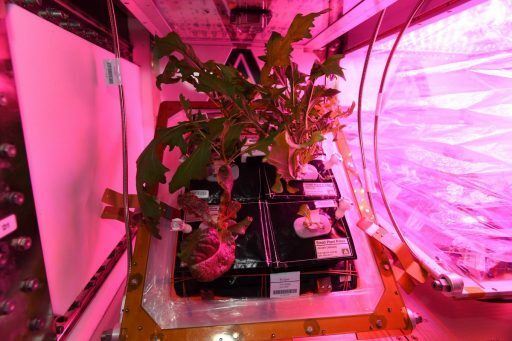 Growing plants in space provides crewmembers with fresh foods to supplement their diets, as well as a positive effect on morale and well-being. Performing the experiment in microgravity is necessary to properly assess the hydrogel behavior in an environment of reduced fluid motion due to the absence of gravity-induced processes. This will allow for a more precise analysis of the release of the antibiotic agent from the cross-linked or mixed hydrogel patches. The improvement of drug-releasing dermal dressings and patches is of great desire for the prevention of sepsis; however, there currently is no wound dressing that can release antibiotics for long enough to successfully prevent sepsis – a major issue faced by combat-inured soldiers. 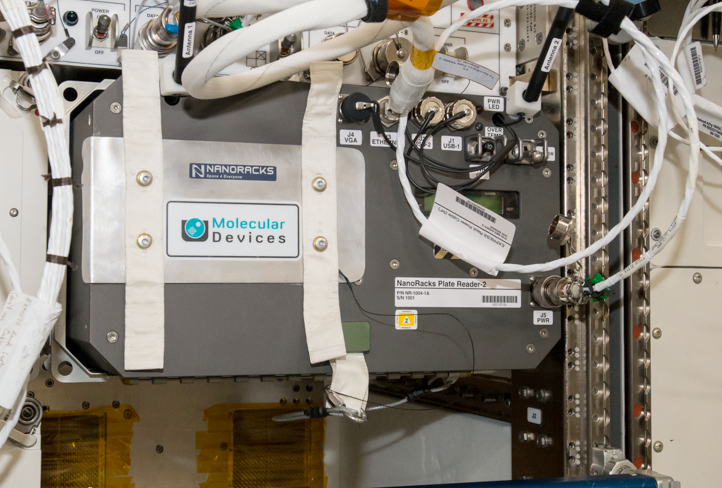 The goal of NanoRacks Module 74 is providing the data needed for evaluating a series of hydrogel formulations and study how drugs release from the gels in the absence of gravity to further the development of new devices for humans in high-stress environments. Understanding the mechanisms of drug release in microgravity can also be beneficial for the development of patches, implants or other devices to help keep astronauts physically robust while on extended journeys to distant targets. 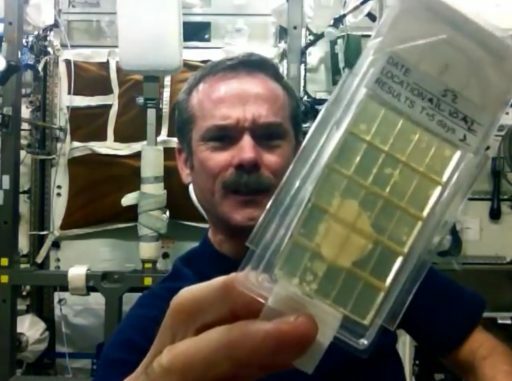 The NanoRacks Module 74 flight equipment employs NanoRacks Reactor Microplates serving as reaction vessels and providing the crosslink for the hydrogels. Drug release from the gels is measured using the NanoRacks Plate Reader-2. Experiments will be run with unloaded hydrogels to study their mechanical and structural properties while a second set of experiments involves crosslinking hydrogels loaded with antibiotics and soaking them in enzyme solution to simulate cellular degradation and antibiotic release from the gels. The release profile – collected by means of spectrometry – will be measured over a period of two weeks. The MARROW study, known by its full name Bone Marrow Adipose Reaction: Red Or White?, looks at the effect of microgravity on the human bone marrow. It is known that prolonged exposure to microgravity, just like long bed rest on Earth, has a negative effect on bone marrow and the production of blood cells. The extent of this effect and possible recovery are of interest in space research and for application on Earth. Blood-producing cells of the bone marrow share the confined space within the bone with fat cells which are known to grow at the expense of blood-producing cells during prolonged bed rest. Accumulation of fat cells may directly impact blood cell production and the bone marrow may also provide an explanation for abnormalities in red and white blood cells observed in zero gravity. The MARROW study aims to measure fat changes in the bone marrow before and after space flight. Also, the investigation looks at specific changes to red and white blood cells over the course of a mission. MARROW requires crew members to undergo pre- and post-flight MRT measurements to assess their bone marrow fat while changes in red and white blood cell count and functions are tracked throughout the flight by means of regular blood sampling, chromatographic analysis of breath samples for red blood cell function and changes in gene expression for white blood cells. Data collected by MARROW is hoped to shed light on the mechanisms for spaceflight anemia (red blood cell function), susceptibility to infection (white blood cell function), thrombosis (platelets) in space, and similar conditions on Earth in people with decreased mobility of confined to bed for extended periods. 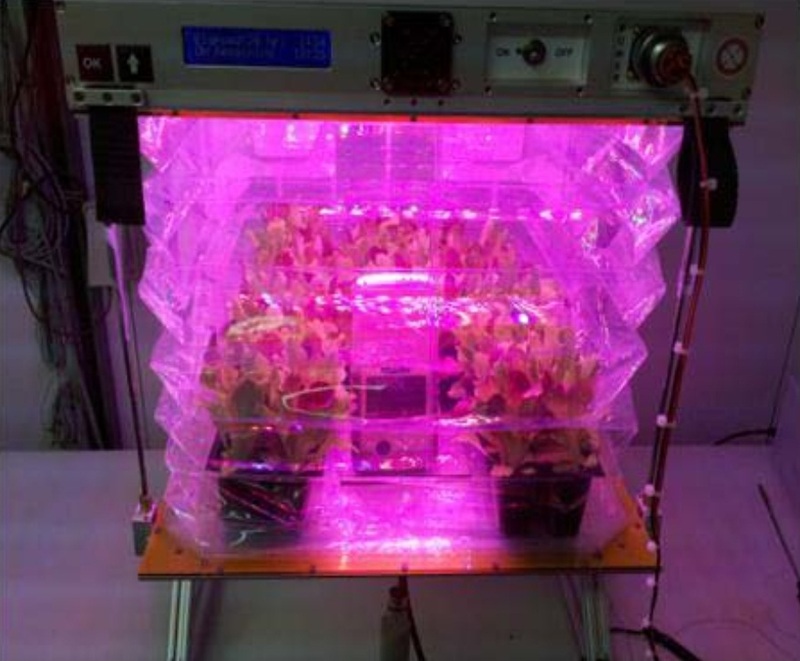 The “Life Cycle of Arabidopsis thaliana in Microgravity” experiment studies the morphology and physiology of thale cress using modular growth chambers for microgravity studies. Plants are grown from germinated seeds under automated light, temperature and nutrient conditions while cameras document the growth at every stage to determine plant viability and the effectiveness of the cultivation modules and nutrient treatment. The experiment is flown on an ExoLab experiment platform designed by magntitude.io as a new type of educational tool to bring together classrooms and the International Space Station for an investigation of the effects of microgravity on living things, accompanied by lesson material for grades 6 through 8. “Working with school districts across the United States along with the Center for the Advancement of Science in Space, Magnitude.io seeks to provide an extraordinary exobiology experience mapped to accepted local science standards while dramatically reducing the cost to access experiments in space,” the company said on its project website. The initiative includes a space-based experiment and ground-based experiments schools can perform in identical ExoLab facilities procured from magnitude.io. Students can look for relationships between the environmental conditions found on Earth and in the space environment that may impact how the plants develop and grow. 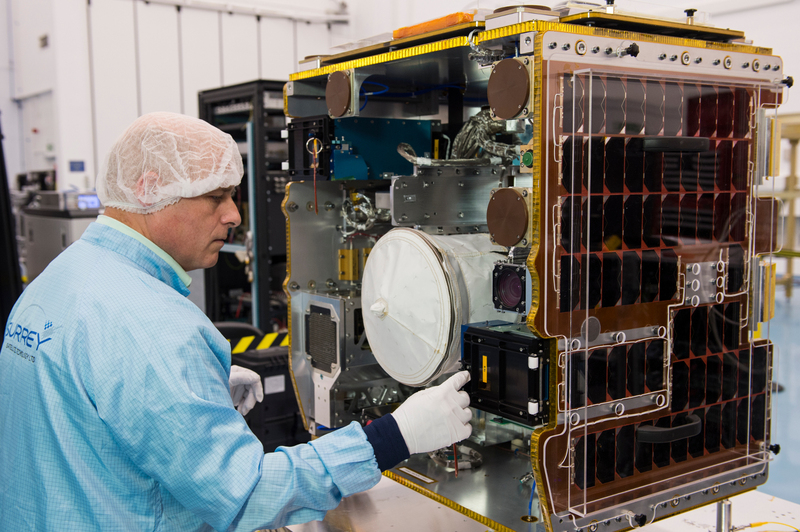 The ExoLab facility is hosted by the TangoLab facility and is designed based on the CubeSat specification, measuring 10 x 10 x 22 centimeters in size (2 CubeSat Units) and hosting a series of sensors and the plant growth chamber itself. Sensor equipment on ExoLab includes luminosity, temperature, carbon dioxide and humidity sensors as well as a camera to document plant growth. The system transmits its data through the Station’s WiFi network and data will be accessible online after downlink from orbit. Arabidopsis thaliana has been chosen as a model organism for the experiment since it is a very well understood species and has been used in numerous previous space experiments. It is particularly well suited for a space-based experiment due to its small size and fast growth rate, allowing multiple plants to be studied. The goal of the Metabolic Tracking experiment is the examination of effects of microgravity on the metabolic impact of five different therapeutic compounds and studying the feasibility of autobioluminescent human tissue culture for continuous metabolic activity tracking without destroying the sample culture. The full name of the experiment is Comparative Real-time Metabolic Activity Tracking for Improved Therapeutic Assessment Screening Panels. Drug studies are frequently found on the Space Station’s science schedule, leveraging the unique environment offered by the Space Station. Some studies take advantage of the fact that the space environment induces effects of aging and bone loss at a much quicker rate while others use the microgravity environment to study drug delivery mechanisms in the absence of masking phenomena induced by gravity-related processes. This enabled a streamlined drug development process and studies into protein crystal structures helps optimize drugs for targeting specific proteins to reduce side effects. The Metabolic Tracking study evaluates a synthetic luciferase gene that can serve as a real-time tracer of metabolic activity through the emission of light (using processes similar to fireflies or luminous jellyfish). For the experiment, modified human embryonic kidney cells will be monitored to sense light emitted to track the metabolic impact of five different compounds and to illustrate the overall usefulness of the monitoring technique. A major advantage of the luciferase tracking method is that it allows for continuous insight into metabolic rates without invasively affecting the sample cell culture. 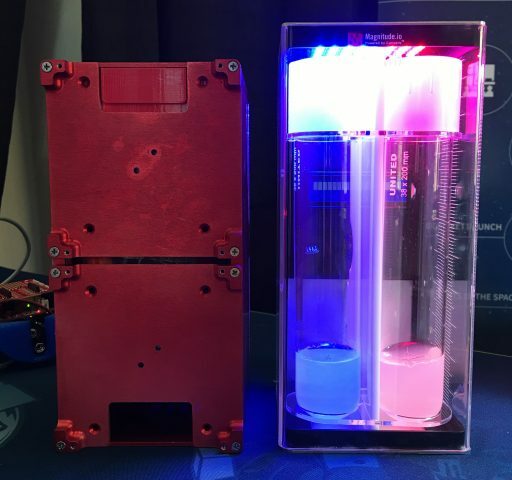 The experiment employs autobioluminescent HEK293 cells and the NanoRacks Plate Reader to monitor the autobioluminescent output of the different samples (with five different agents & different concentrations) for a period of 24 hours. A second experiment with identical samples will run in the SABL incubator at 37°C and elevated carbon dioxide concentration to achieve a maximal alteration to metabolic activity. The Microbial Tracking 2 study will acquire crew samples pre-flight, in-flight and post-flight as well as air and surface samples from various locations of the International Space Station to observe which bacteria, fungi and viruses are present and what impact they may have on the crew’s well being. 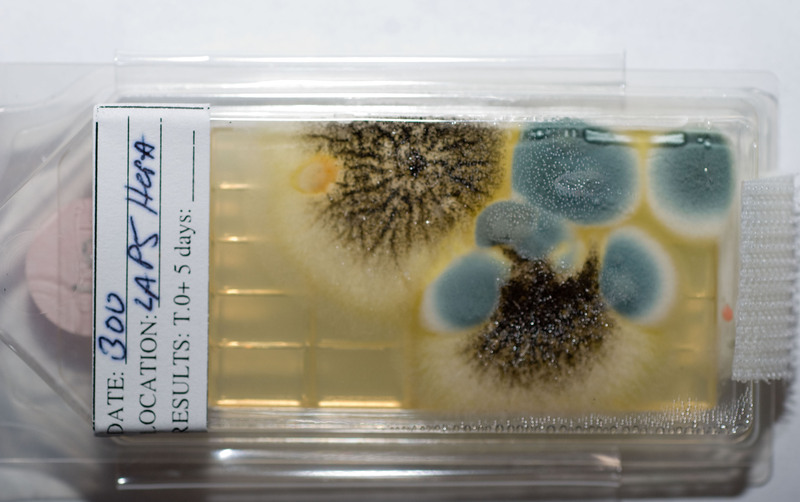 The overall goal of the research is to catalog and characterize potential disease-causing microorganisms aboard ISS and their impact on crew health. 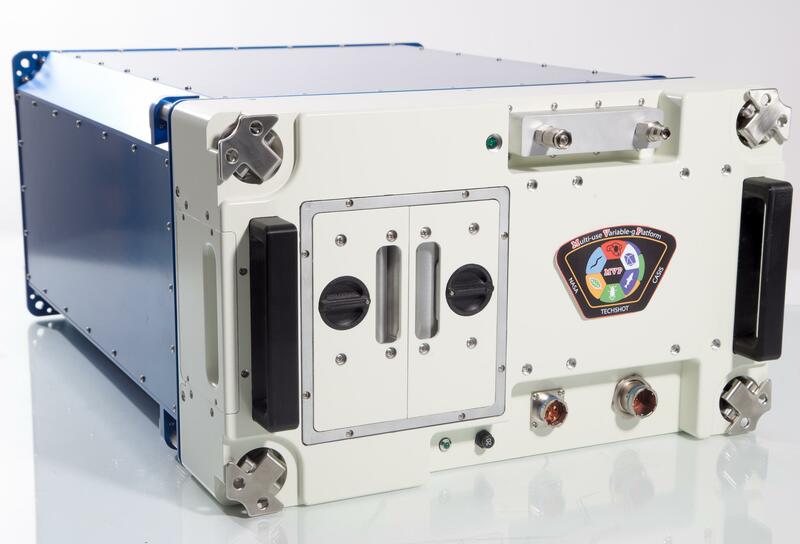 This collection will last for at least two ISS increments to allow scientists to look at the types of microbes that can survive in the space environment and study their changes over time. 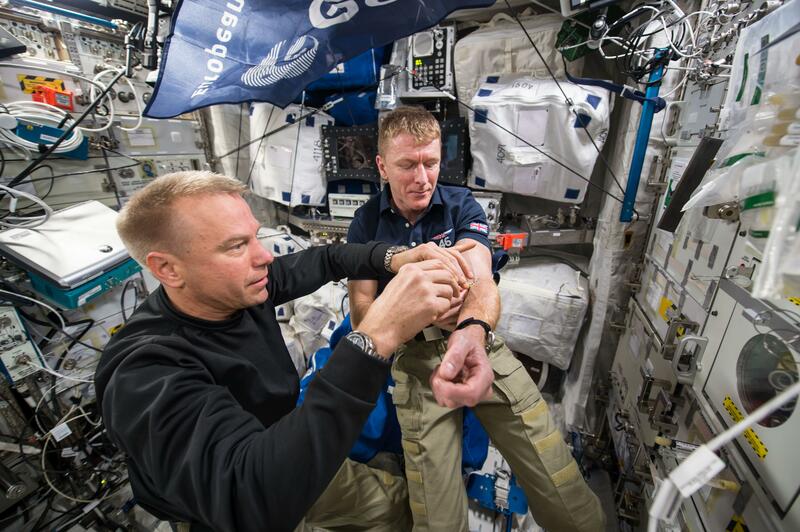 This data is valuable for the assessment of risks to crew health and it also allows a close look at the way microbes adept in space as compared to mechanisms known from Earth-based studies. Experiment data from MT-2 will go down to the cellular level to identify reactions that may be occurring in space but not on Earth which can provide helpful information for the development of antibiotics and antimicrobial agents. The experiment also serves as validation for omics technology in the screening for microbes and identification of those that may be present. MT-2 aims to better understand risks to crew health in a closed environment for infection and illness, assess risk to fouling of clean air supplies and contamination of fluids and food, compare the microbial communities on ISS and on Earth in normal and extreme environments, identifying specific microbes that flourish in the space environment and conduct a study of the adaptation of microbes to the space environment. Three ISS crew members will participate in the study, collecting baseline data at launch minus six and three months (four sampling operations over one week), in-flight data at L+ 1-2, 2-4 months and return minus ten days and post-flight data at R+1 day, 1 month and 6 months. Samples taken include saliva and oral swabs, skin swabs from forehead, armpit, retroauricular crease, antecubital fossa, naval region and nasal cavity. The experiment uses air and surface samples collected from the various ISS modules, stored at room temperature and returned to Earth within two weeks of acquisition. Sample methods of MT-2 include adhesive tapes, swabs, contact slides, wipes, gelatin air filters and used gloves. Eight specific locations for surface sampling and six air sampling points have been selected – the zero-G stowage rack (ZSR) surface and dining table inside Unity (Node 1); crew quarters (CQ3) interior port wall inside Harmony (Node 2); overhead hatch area of cupola, rack next to waste and hygiene compartment (WHC), and foot platform of the advance resistive exercise device (ARED) inside Tranquility (Node 3); the ZSR surface inside Leonardo PMM; and the rack front near portable water dispenser (PWD) inside Destiny (Laboratory). This investigation from Budweiser is continuation research that seeks to evaluate the germination of barley seeds and growth of barley seedlings grown in a microgravity environment. Morphological and genetic effects of the microgravity environment on samples will be assessed in orbit and upon return. A better understanding of barley’s response to microgravity could help investigators adapt the grain for use in long-duration spaceflight. The Genes in Space student research competition, founded by Boeing and miniPCR and supported by CASIS, invites students to propose pioneering DNA amplification experiments that utilize the unique environment of the ISS. Two experiments were selected as winners from the 2017 competition, both flying on this mission. Elizabeth Reizis, age 14, from Stuyvesant High School in New York will examine the effects of microgravity on the differentiation of immune system cells. Sophia Chen, age 14, from Lakeside School in Washington aims to measure cancer-inducing genomic instability in astronauts. Spaceflight causes many changes to the human body, including a weakened immune system and alterations in DNA. Findings from these experiments could lead to a better understanding of how to safeguard astronaut health in space. Higher Orbits Go For Launch! This educational project with students from Morehead (KY), which is part of the Higher Orbits Go For Launch! program, will examine the effectiveness of lactobacillus probiotics in the space environment. The yeast Candida albicans is responsible for a variety of systemic and superficial infections in people with weakened immune systems. This study aims to develop a more complete understanding of the process by which lactobacillus is able to limit Candida growth. This payload from the Quest institute includes four independent experiments. The first will examine the effect of microgravity on plant growth properties using the Bio-Available Mineral Formula-X nutrient solution. The second experiment will observe seed germination and tolerance after exposure to an electric field in microgravity. The third and fourth experiments will assess the behavior of heat and humidity in microgravity based on different heating and cooling methods. The National Design Challenge is a series of student engagement challenges in which young explorers compete for the opportunity to send experiments to the ISS National Lab. This winning experiment from the Chicagoland Boys Scouts and Explorers is focused on the use of an infrared spectrometer to investigate beta-amyloid peptide, a key contributor towards the proliferation of Alzheimer’s Disease. Oak Ridge National Lab, in partnership with the University of Tennessee-Battelle, is sending a second experiment to the ISS National Lab aimed at producing high-quality crystals of the medically important enzyme acetylcholinesterase. Crystals grown in microgravity are often larger and more ordered than those grown on the ground. This investigation seeks to utilize the microgravity environment on the ISS to produce crystals large enough for neutron diffraction analysis. Such analysis could provide essential insights into the enzyme’s structure, how it functions in the human body, and how it might be bound by nerve agents to no longer function. Findings from this investigation could lead to the development of novel therapeutics that may decrease morbidity and mortality rates from exposure to chemical agents that affect acetylcholinesterase, such as overexposure to pesticides (both in humans and livestock) or exposure from potential chemical warfare attacks. This payload, from the Princeton Institute for the Science and Technology of Materials, seeks to measure the time dilation effect (the idea that time moves more slowly for a moving clock than for one standing still) predicted by Einstein’s theories. To do this, the investigation will examine the performance of a clock designed with nanosecond precision. A secondary payload will examine the mutation rate of isolated plasmid DNA over an extended period of time on the ISS. The DNA sample will be sequenced before and after going to space, and the number of mutations in the flight sample will be compared with the number of mutations in a ground control. This investigation seeks to demonstrate the ability of Space Tango’s Fan Module to direct air coming into the facility toward specific internal elements to keep them cooler. Successful demonstration of the Space Tango Fan Module would increase the number and types of investigations able to be carried out onboard the space station. The winning students from the 2017 Wisconsin Crystal Growing Competition will grow crystals onboard the ISS National Lab to test their optimized conditions for Earth-based crystallization against microgravity-based crystallization. The students adapted their Earth-based crystallization methods to prepare a flight project and will compare the crystals grown in microgravity with crystals grown on the ground.